Tap dance to the Beatles! Here's a creative riff on "Come Together," lovely choreography and well filmed. Casual flattfoot dancing: Dancer Paul Anderegg is shown just dancing by himself in a corner of a large hall while Wild Asparagus plays for the contra dance going on all around him. No performing for the camera, just a very skilled dancer having fun moving to the music and giving what ends up as a beautiful showcase of this style of low-to-the ground Appalachian dancing. Another terrific example is this 1987 video of Ira Bernstein doing a very polished demonstration. Double Your Pleasure showcases a trio of dancers doing a creative jitterbug routine. The choreography—one man and two women—reminded me of watching Norwegian telespringar many years ago, only that was improvised and this is highly choreographed. For a look at a Norwegian dance with three persons, go to this link and jump ahead to 13:55. Is this Love? (Bob Marley) features Keone and Mariel Madrid posing as an elderly couple. Good humor! You can spend a lot of time on YouTube just watching these two urban dance stylists. They also have a great dance set to Michael Jackson's "Dangerous." Cellist Yo-Yo Ma and hip-hop dancer Lil Buck combine talents for an unexpected and beautiful pairing of dance and music captured in this video. Shag (a style of swing dance that originated in South Carolina), here danced by Kayla Henley and Jeremy Webb, two high school students who won a national competition. Here's another example, so S M O O O T H, danced by Charlie Womble & Jackie McGee. Links Note: Unlike most of the other links on this website, some of the links on this page will take you away to a new page. To get back here, you'll need to use your browser's back arrow, or bookmark this site for reference. Thanks for your visit. Country Dance and Song Society ("Continuing the traditions. Linking those who love them.") promotes English and Anglo-American music, dance, and song. To further its mission, CDSS offers weeklong dance camps in four locations, publications, scholarships, grants for special programs, insurance programs for callers and affiliate groups, and much more. Lloyd Shaw Foundation ("To recall, restore, and teach the folk rhythms of the American People") honors the legacy of the dynamic leader from Colorado who did much to popularize traditional American dance. It's impossible to discuss American square dance without paying tribute to the vital tole that Lloyd Shaw played. The LSF offers dance instructions, recordings, kits for elementary and high school teachers. The New Hampshire Library of Traditional Music and Dance at UNH is home of Ralph Page's papers and recordings, along with valuable material from Ted Sannella, Country Dance and Song Society, and many others. UNH also makes available online a complete set of Page's Northern Junket magazine. NEFFA (the New England Folk Festival Association) is best known for the wonderful festival it produces each year in April, in Mansfield, MA. It's a full weekend with four dance venues and numerous workshop spaces, filled with contras and squares, English country dance, international folk dance, concerts, workshops, performances, and jam sessions galore. The Ralph Page Dance Legacy Weekend, held annually during Martin Luther King weekend in January at the University of New Hampshire at Durham, brings together dancers, callers, and musicians for a weekend of dance, music, and discussions. In addition to showcasing new dances, versatile callers, and top-notch musicians, more attention is paid to contra dance history and traditions at this event than at any other I know. The Dance Flurry in Saratoga Springs, NY, celebrates 25 years of producing a jam-packed February weekend of music and dance: contra, swing, Latin, English country, squares, Cajun, zydeco, Irish, Scandi, Middle Eastern, international folk, vintage, clogging, singing, too! The Lebanon, NH, Valley News gave great coverage to a 2014 event held in a restored dance hall. See the story and photographs, and the video. The Pavilion is now the host for five community dances each summer. How to be a hip, cool dancer - Created by a musician, based on what he's observed from the stage. Noah VanNorstrand also has an apt lesson on Contra Dance Etiquette for the Guys. (Here's another video of the song.) You can read the lyrics here. Some 250 people showed up to help the band celebrate its 31st anniversary in November. (See blog post on the subject for more info.) This video shows some of the dances from that night. This is a collection of one hundred—yes, 100!—videos documenting Dare To Be Square, a squares-only dance weekend featuring six prominent callers. It was held at the historic John C. Campbell Folk School in Brasstown, NC, with additional support from Country Dance and Song Society. The same videos are available on a new YouTube channel. The documentation and the weekend are part of the Square Dance History Project that David Millstone is coordinating; more information is available at that site. The SDHP site includes two clips filmed in Kentucky in 1963, material for which I waited more than two years to obtain permission. Here's a link to the four-couple square and a link to a big set. Crac! This extraordinary portrait (1981) of life in Québec by the noted Canadian animation artist Frédéric Back is told solely through images and music, including a spectacular evocation of traditional dance. At one time, the CBC offered a DVD collection of his films, including Crac!, The Man Who Planted Trees, The Mighty River, a film about the St. Lawrence, and six others. For years, it was very hard to find this video, but now it's available on YouTube. Hooray! Old Movie Stars Dance to Uptown Funk: The title says it all. Fred Astaire, meet Bruno Mars. Rita Hayworth meets the BeeGees! Feeling depressed by the state of things? This video clip—"Bring Me Sunshine"—will almost certainly bring a smile to your face. Flamenco at 5:15 This short film is an impressionistic record of a flamenco dance class given to senior students of the National Ballet School of Canada by two great teachers from Spain, Susana and Antonio Robledo. Beautiful photographed, it's thrilling to watch these young dancers explore another dance language. Gordon Peery describes the history of New England contras and pays a tribute—with musical help from several dozen others—to Bob McQuillen. Recorded July, 2012, in Peterborough, NH. As part of her work at the SALT Institute for Documentary Studies in 2013, Mary Wesley created a fine piece about the Monday night dance in Nelson, NH. Susanna Bolle also visited Nelson to create a website on the Contra Dance Capital of the World. Susanna's project includes a section on the Monday night dance, a visit with Bob McQuillen, some history about the town of Nelson, and an article about dancing in Nelson (now--January, 2019) no longer online, alas. Folkstreams offers a great collection of documentary films on all manner of folk-related subjects. One classic resource was created in the mid-1970s, when "contra dance" was gaining an identity as a separate genre but before evenings became as contra-centric as many are today. Larry Jennings was an enthusiastic dancer, caller, choreographer, organizer, and dance philosopher active in the Boston area scene; he created a handout describing Almost All You Need to Know to Enjoy a New England Style Dance. It's still a useful introduction. As contras have spread across the country in the past 40 years from their New England roots, local groups elsewhere have created a large literature to explain the dance form to newcomers. The Mid-Missouri Traditional Dancers have a well-written Tips for Beginners on their website. Gary Shapiro answers "What Is Contra Dance?" in some interesting ways. The Chattahoochee Country Dancers in Atlanta have produced Contra Dance Basics, a series of instructional videos available on YouTube that explain contra dance figures. From Wisconsin, some answers to Contradance FAQs. Hamilton, Ontario, offers up A Contra Dance Primer. Greg Rohde, a dancer in St. Louis, published an entertaining and informative essay, Hands Four, about the delights of contra dance. The Mid-Missouri Traditional Dancers offer Tips for Experienced Dancers. Cynthia Van Ness has a thoughtful essay encouraging folks to appreciate your local callers. The syllabus created for the Ralph Page Dance Legacy Weekend each year is an extremely valuable resource for callers, one of the finest collections of dances to be found online. The weekend includes examples of classic contras and squares along with contemporary dances. (It's the only dance event where evaluations might include the comment, "Not enough triple minors.") 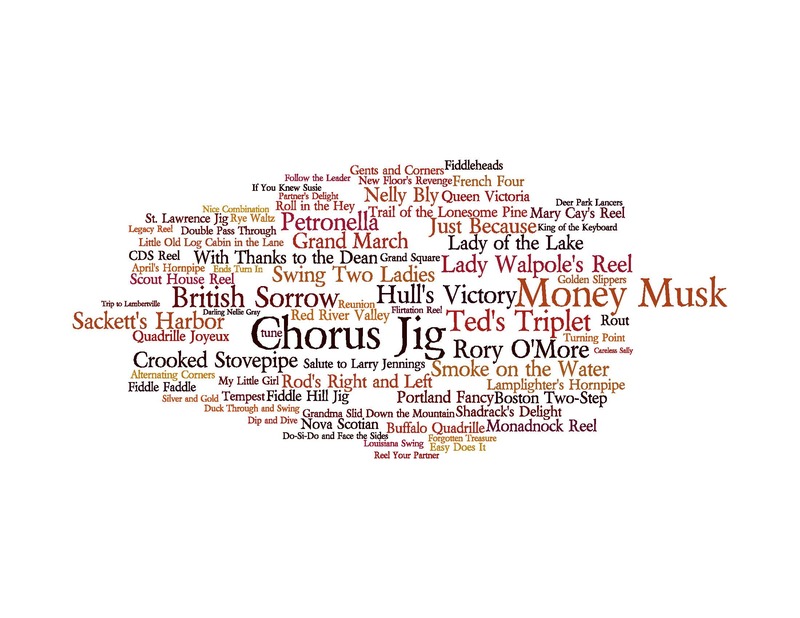 Here's a Wordle showing dances often on the program at the weekend. Index of audio clips from live recordings of modern western square dance calling from the 1950s and 1960s. These examples include superb dance calling; with just a few exceptions, the calls and choreography would be enjoyed by dancers today. Most readers who have made it to this page know about the pivotal contribution made by Cecil Sharp. Copies of Sharp's Country Dance Books are available. Less well known is the vital role played by his Sharp's contemporary, Mary Neal. There are several handy online references for English country dances. This one includes many Playford dances, and this one is a work in progress that includes more recent dances as well. Looking for videos of English dances? The Lambertville Country Dancers have a LARGE compilation of videos collected here; Bob Green's Dance Video Archives provides a smaller number but with accompanying instructions for each dance. New York caller Paul Ross has his own YouTube channel, Childgrove, with many well-danced examples, including dances by Fried Herman. The channel's sampler video, "English Country Dancing Done Well," includes three dances videotaped by David Millstone. This handy site lets you tap your finger on your computer and will tell you how many beats per minute that is. Ever so useful if you're trying to make a record of the tempo! John Chambers created this detailed index to tunes in ABC notation. Once you have the ABC notation, copy it and paste it here and a few seconds later you can be printing out a nice PDF to hand the musicians. Dorothea Lange's Ireland The great photographer, best known for her images from the US in the Depression years, visited Ireland in 1954. This collection of evocative photographs from County Clare is backed by a lovely collection of tunes played on accordion by Tony MacMahon. Master Class with Barbara Cook: This video shows the singer working (for two engaging hours) to loosen up some younger talent, helping them shed their classical training in order to sing popular songs in a more appropriate style. Dec. 2014 update: You could start with this Bobby McFerrin clip on YouTube and easily spend the next few hours wandering from one link to another, listening and watching the man light up concert halls around the world. He frequently will invite audience members to come up to take a second mic, and then will improvise a duet with them. Such a talent!